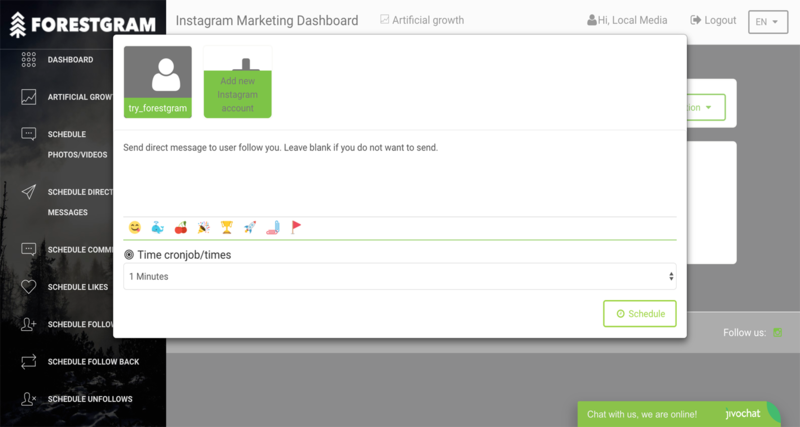 Grow Instagram on autopilot with Forestgram. Auto liking,Auto follow based on a location,hashtags,auto unfollow,auto follow back with direct message, schedule comments based on a hashtags or feeds,schedule direct messages to followers/following accounts,hashtag statistics. 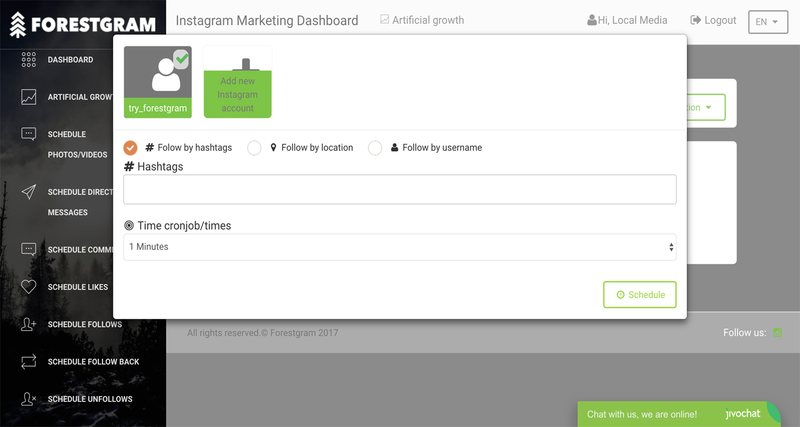 Forestgram - an innovative online marketing tool for growing followers and likes on your Instagram profile. Want to update your followers/customers or send them new offers? Type the message, select accounts followers or following users, click on select all and Schedule the message. Schedule commenting based on a hashtag,timeline feed,popular feed or explore tab feed. Forestgram will not comment all images related to hashtag/feed everyday, it will comment only on those that you will select and schedule. Select hashtags or location and Forestgram will automatically like all the photos. 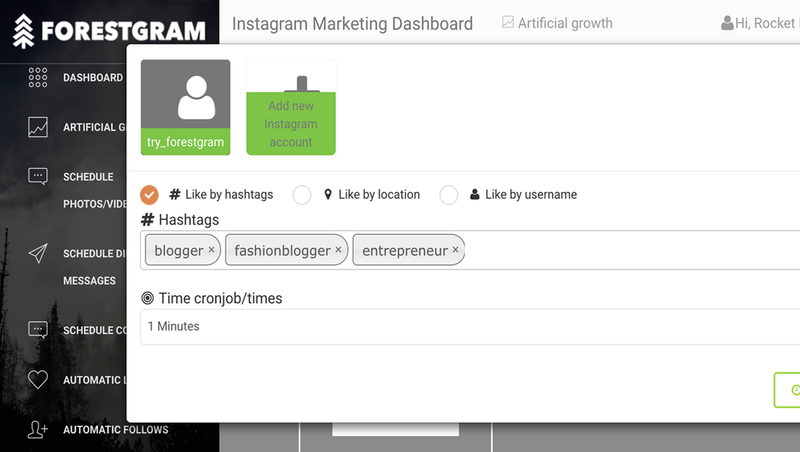 Forestgram will follow Instagram accounts from your account based on a hashtags or location. Forestgram will follow back all users that will follow your account and will also send direct message to them. 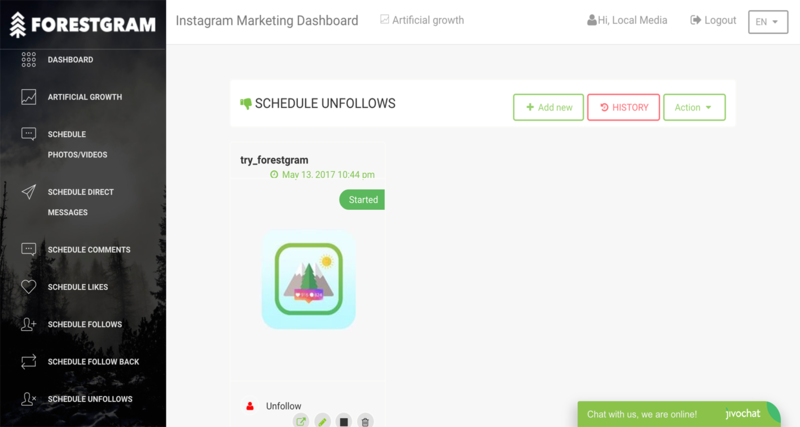 Unfollowing all followers is a very long process that will take a lot of time,automate unfollowings with Forestgram and we will unfollow from all your accounts. Not sure of features and want to see it in action? Every business requires a solid online presence with a global reach. Since Instagram is a platform that connects customers with business, your Instagram profile is your store front and leaves an impression about your company. Most of the times, through our research and all our startups we launched along side with Forestgram we have witnessed that the first customers that find your business are from Instagram, therefore content,amount of followers and likes play a big role. After sign up and successful transaction we will send you an email and your account will be live. Our robots will do the work for you 24 hours a day. Our powerful software can grow your Instagram account through native ways by interacting with users from the target audience. Select your plan on Pricing, click on Choose plan, fill out your details and provide payment. After we will receive a payment we will contact you that your account is live now. If you have selected Small Business or Standard packages you will receive email confirmation that you can now login to perform marketing. If you have selected Premium package, we will contact you with details and growth reports. 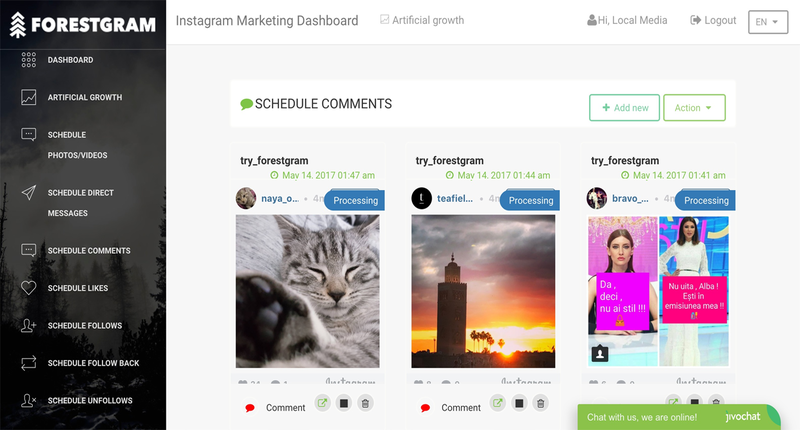 a powerful software that can grow your Instagram account through native ways by interacting with users from the target audience. How it can help you and your business? It can grow your Instagram followers naturally or artificially. 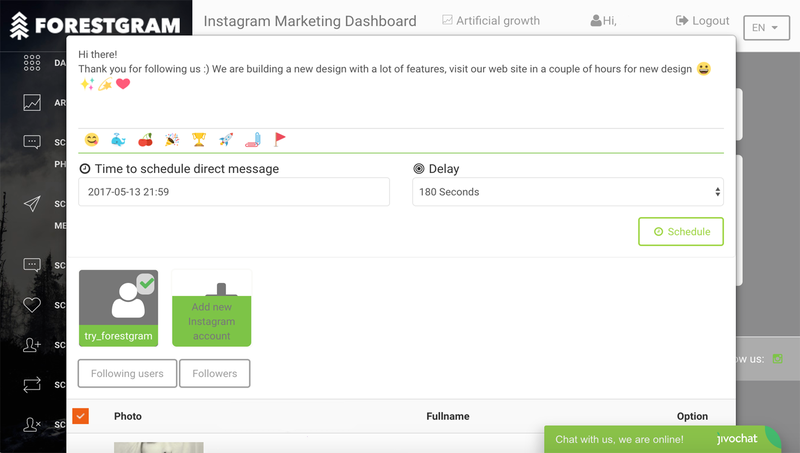 Natural Instagram growth - by using Forestgram marketing tool you can set hashtags you want us to like or comment images on behalf of your account: 60-80 likes per hour, you can post photos,videos from our dashboard and much more. Artifical Instagram growth - we have created thousands of profiles on Instagram that look like real ones, but controlled by our software. You can select amount of followers you require us to add and we can increase your followers or likes up to 500 000 in a short time. Will I be blocked from Instagram from using Forestgram? No. Forestgram is safe. We do not recommend any manual activities such as liking, commenting while your account is linked with the app since these interfere with our software activities. Does Forestgram keep working when I'm not logged in? Absolutely, Forestgram keeps working even when your not logged in on you're account in order to maximize your social media engagement. You can stop Forestgram at any time from the dashboard. Are the followers and likes real? Yes, our software acts as a real person who will login to Instagram and like/follow/unfollow/send direct message etc. to selected account based on a target audience. The followers and likes will be real from people we will engage with. Currently we are using Paypal payment gateway. If you have selected monthly payments you will billed monthly and if you have selected annual payments you will be charged annually. Send us an email to payments@forestgram.com and you will be contacted shortly. Can I refund the amount? The refund unfortunately is possible only on Premium package and only during 2 days since the payment received. See how the award-winning Forestgram can help you reach your local customers. ©Forestgram, 2017. All Rights Reserved.